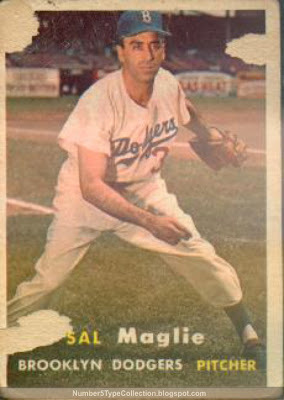 Sal's nickname, "the barber," came from his willingness to throw beard-trimming brush back pitches. Something held this card fast before being forcibly removed. Whatever plucked it away didn't use anything so cunning as a razor. Did a young collector tape it to his bedroom wall? It's a Brooklyn Dodger! 1957 marked Topps' first year of full-color photos and the Bums moved to LA for 1958, so we don't see much of Ebbets Field on classic cardboard. 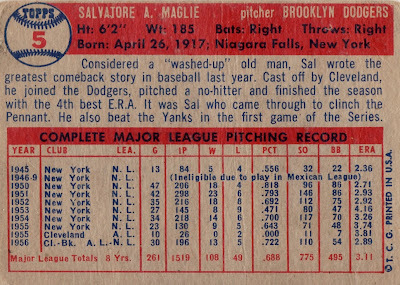 Most of my 1957 set looks like Sal not only brushed it back, but went in and stepped on it, too. The cards feature a lot of writing, creasing, and paper loss of varying sizes. The PSA folks might cringe, but I find (for example) Mr. Maglie's card more entertaining than a high-grade equivalent. Even at low-grade, the short-printed middle series takes a while to put together. Rookie cards of the Yankee middle infielders Tony Kubek (#312) and Bobby Richardson (#286) both command high prices. When I gave a 1957 Milwaukee Braves team set to my dad, it originally lacked Wes Covington (#283) since I simply couldn't find it, high-priced or otherwise. 1956 remains my favorite Topps set, but a number of collectors prefer 1957's color photography and improved rookie class. (Brooks Robinson, Frank Robinson, and Don Drysdale count as three of the best.) I give the edge to 1956's two-picture composition and larger, horizontal cards. Fortunately, that just splits hairs between two of the best options. It's nothing like deciding what's worse, 1969's hatless expansion set or 1968's burlap sack borders.